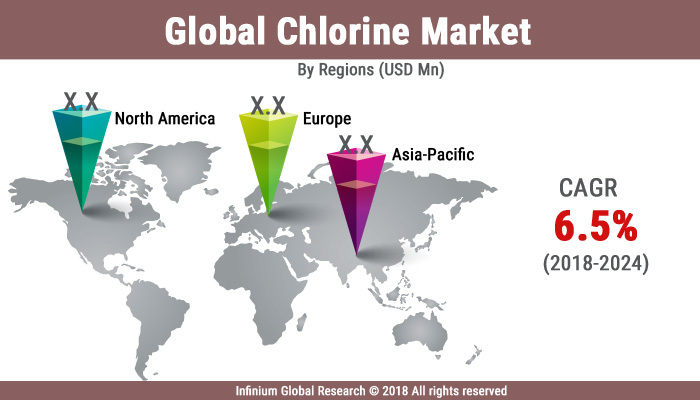 A recent report published by Infinium Global Research on chlorine market provides in-depth analysis of segments and sub-segments in global as well as regional chlorine market. The study also highlights the impact of drivers, restraints and macro indicators on the global and regional chlorine market over the short term as well as long term. The report is a comprehensive presentation of trends, forecast and dollar values of global chlorine market. According to the report, the global chlorine market is projected to grow at a CAGR of 6.5% over the forecast period of 2018-2024. Chlorine is an essential chemical building block, used to make several products that contribute to public health and safety, advanced technology, nutrition, security, and transportation. The element of chlorine is normally present in the diverse chemical compounds. Chlorine has high chemical reactivity thus it is difficult to find the individual element of chlorine. Chlorine is in the gas form at room temperature and has a yellow-green color with an irritating aroma like bleach. The chlorine is mainly used in industrial and residential cleaning products. The numerous applications of chlorine in the various industries such as chemical industry, plastic, water treatment, paper pulp, and others are the factors driving the growth of the chlorine market worldwide. The most water treatment plants present across the globe use chlorine in their water treatment process. In addition, the use of chlorine as the raw material in the production of various chemicals contributes to the growth of the chlorine market. The demand for chlorine is prospering in construction sectors as the chlorine is an important element in the production of PVC. However, increased handling and transportation charges of chlorine due to its highly explosive nature hampers the market growth. Moreover, growing demand for the improved drinking water and sanitation, the growing use of chlorine in medicine to create lucrative growth opportunities in the near future. The report on global chlorine market covers segments such as applications and end use industries. On the basis of applications, the global chlorine market is categorized into chemicals, PVC, solvents, water treatment, and others. On the basis of end use industries, the global chlorine market is categorized into the water treatment industry, chemical industry, pharmaceutical industry, plastic industry, paper and pulp industry, and others. The report provides profiles of the companies in the global chlorine market such as BASF SE, Tata Chemicals Ltd., Tosoh Corporation, PPG Industries, FMC Corporation, Ercros S.A, Covestro A.G., Occidental Petroleum Corporation, Hanwha Chemical Corporation, and Ineos Group Ltd. The report provides deep insights on demand forecasts, market trends, and micro and macro indicators. In addition, this report provides insights into the factors that are driving and restraining the global chlorine market. Moreover, IGR-Growth Matrix analysis given in the report brings an insight into the investment areas that existing or new market players can consider. The report provides insights into the market using analytical tools such as Porter's five forces analysis and DRO analysis of chlorine market. Moreover, the study highlights current market trends and provides forecast from 2018-2024. We also have highlighted future trends in the chlorine market that will impact the demand during the forecast period. Moreover, the competitive analysis given in each regional market brings an insight into the market share of the leading players. This report will help manufacturers, suppliers, and distributors of the chlorine market to understand the present and future trends in this market and formulate their strategies accordingly.